For Pi-to-Pi communication, you can choose among a number of different protocol options, and some excellent cross-platform messaging protocols meet simple data-passing requirements, including Advanced Message Queue Protocol (AMQP) , Constrained Application Protocol (CoAP) , Message Queuing Telemetry Transport (MQTT) , and Simple/Streaming Text-Oriented Messaging Protocol (STOMP) . Moreover, some popular middleware solutions like RabbitMQ  layer on top of the messaging protocols and offer a generic interface with many added features. For simple Pi data-passing projects, MQTT is something you should seriously consider. MQTT is a lightweight, well-documented solution that is easy to install. Many Internet of Things (IoT) options are available, and Arduino has a number of libraries that support MQTT. The MQTT broker manages and distributes messages. 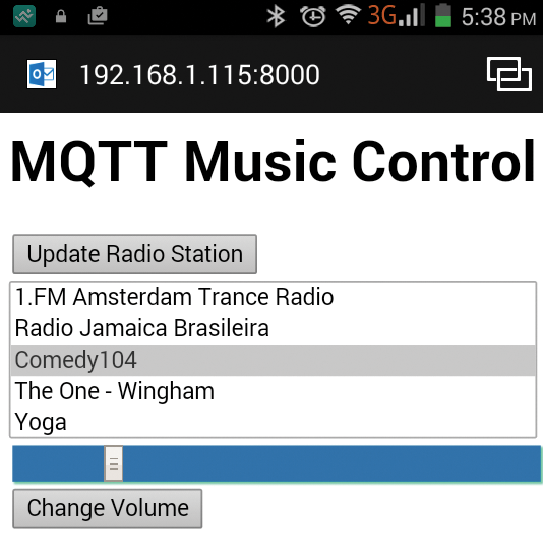 The MQTT publisher is a source of data. The MQTT subscriber receives the data. Open source MQTT brokers exist for Windows, Linux, and Mac machines, and a number of public MQTT brokers can be used for testing or for IoT applications. In a simple example, one Raspberry Pi (Rasp Pi) can be an MQTT publisher and a second Rasp Pi can be an MQTT subscriber. 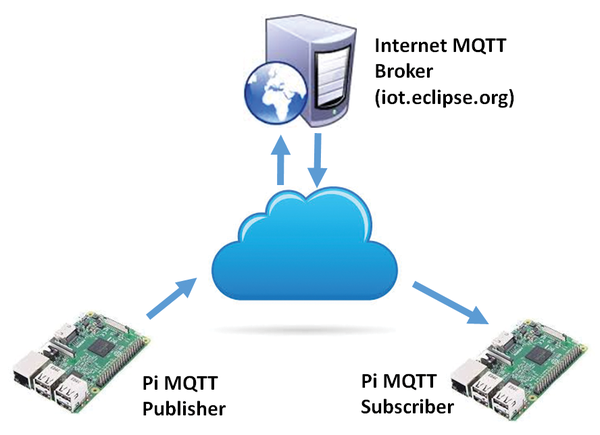 An MQTT public broker, such as the Eclipse IoT , manages the message handling and is referenced by both Rasp Pis. Figure 1 shows this basic layout. 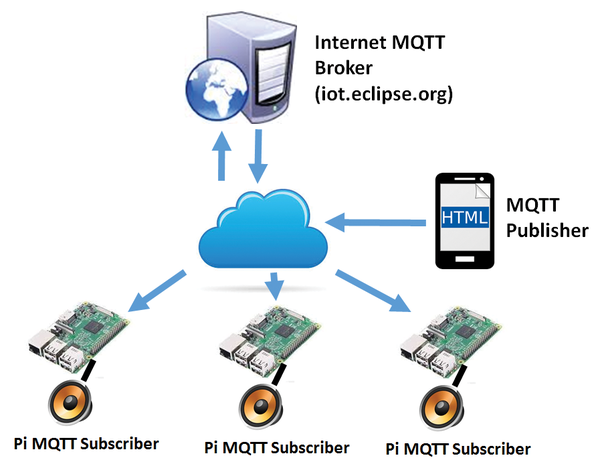 Figure 1: Simple MQTT publisher, subscriber, and broker. The <topic> parameter is a unique name that links subscribers and publishers together, and payload is the message sent. Topics are case sensitive, and payloads are strings ("None" sends an empty payload). Using JSON, it is possible to dump complex data structures into a single payload string. Listing 1 is a simple publish program that uses the iot.eclipse.org public broker and sends the time as a message in the topic mydata. The subscribe() function topic needs to match the publisher topic; you can subscribe to multiple topics with the same client object. The quality of service (qos) option prioritizes messages. Listing 2 is a simple subscribe program that collects data from the mydata topic. Figure 2: Web page controlling three Rasp Pi music players. mpc add <radio station url> adds a radio station to a playlist. mpc play <play list number> plays a selected playlist. mpc volume <number> adjusts the volume between 0% and 100%. mpc clear clears the playlists. The Internet Radio website  lists a number of Internet radio stations. 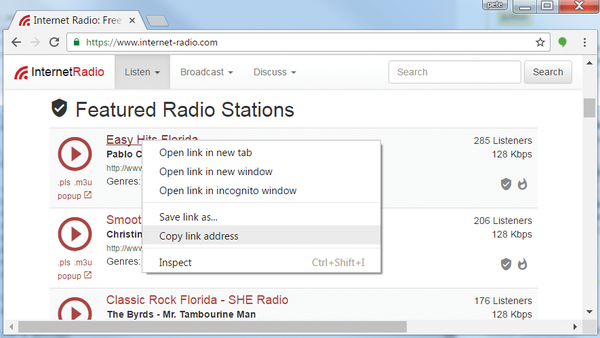 To discover a radio station's URL, right-click on any of the station links and select Copy link address (Figure 3). Figure 3: Getting URLs for Internet radio stations. converts from a byte array to a generic string. When a new radio station is received, the current playlist is cleared (mpc clear), the new radio station is added to the playlist (mpc add), the volume is reset to its original value (mpc volume), and the radio station plays (mpc play). If the payload is numeric only, the volume changes. The full Rasp Pi Python program is shown in Listing 3. Figure 4: Internet radio web page. Figure 5: MQTT brokers support WebSockets. A low-cost FM receiver connected to an Arduino module lets you play your favorite stations.